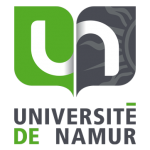 La prochaine journée de notre école doctorale, qui avait dû être reportée en raison des événements du printemps dernier, se tiendra le 30 août 2016, à l’Université Saint-Louis-Bruxelles. 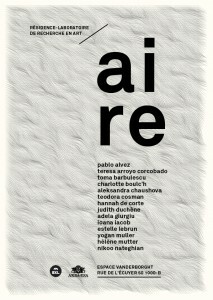 Partager la publication "Journée des doctorant(e)s de l’Ecole doctorale en Art et sciences del’art"
Partager la publication "25 mars 2016 – Journée des doctorant(e)s de l’école doctorale en art et sciences de l’art"
Première édition de la résidence-laboratoire de recherche en art Aire. Dexia Art Center, Bruxelles, mars 2016. 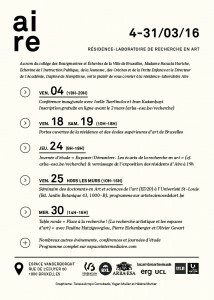 Partager la publication "4-31 mars 2016 Résidence-Laboratoire de recherche en art / aire"
Partager la publication "Séminaire annuel de l’ERG, 8-10 février 2016"
Partager la publication "4 mars 2016 – l’expérience de l’erreur en photographie comme stratégie artistique"
Alexander Damianisch, Universität für angewandte Kunst Wien, former manager of the Austrian programme for Arts-based Research (PEEK), board member of SARAbout the conferenceThe relationship between artistic practice and writing in the context of research is a challenging and much debated topic, both in and outside the framework of art degree programmes. Often the relationship is felt to be one of friction, opposition or paradox. Writing gives an explicit verbal account of the implicit knowledge and understanding embodied in artistic practices and products while at the same time art may escape or go beyond what can be expressed by words and resist (academic) conventions of accountability. A ‘written element’ is almost always asked for in the context of higher arts education, as well as by funding agencies, so the artist-researcher in that context often feels cornered, and has to meet opposing demands at the same time. However, in the debate on art practice and writing the fact that writing itself is a practice is often bypassed. Giving a linguistic expression to one’s research is work that demands as much dedication and commitment as creative work does. Moreover, writing is not just practice, but itself creative work, a constructive process that enables the emergence of the new and the unforeseen. What is the role of writing in artistic research and what type of voices may emerge? Furthermore, while writing can be seen as a form of practice, the same is true for the inverse: in the context of artistic research, practice is a form of writing; a non-propositional form of writing, to be sure, but in artistic research material practices and products not only embody knowledge and understanding, but as agents in a methodological sense, are also the vehicles by which that knowledge and understanding is produced and conveyed. Here practice is making a case, a claim; a discursive practice that comprises (paradoxically?) non-discursive, i.e. non-propositional material. This years SAR conference will address writing in relation to artistic research from these perspectives: writing as practice and practice as writing. How do both writing and practice operate as ways to convey new knowledge, understanding and experiences by which we (re)organize our lives? In workshops, demonstrations, performances, discussions, open sessions and on-the-spot encounters we will contribute to the ongoing development of the relationship between practice and writing in the context of artistic research. The conference, along with the keynote presentations, will include parallel workshops in the four strands mentioned above. We invite you to submit a proposal for a contribution to one of the strands and intend to provide space for in-depth discussions and active involvement of all participants. We are therefore asking for proposals of 5 to 10 minutes for statements, performances, short papers, interventions, and proclamations. Although we are not following the traditional format of a longer paper followed by Q and A we will accept a few proposals for longer papers (up to 20 minutes) if it is relevant to the intended strand. All of this will provide the ground for intense discussions during the conference on its theme: the relationship of art practice and writing in the context of research. Please submit your proposal, of no more than 300 words, before 11 January 2016. Indicate which strand you are submitting for and the duration of what you are proposing as well as any special requirements you may have for your contribution. E-mail your statement to conference2016@societyforartisticresearch.org, including your name and e-mail address and, if applicable, your affiliation and relevant web link. The selection of proposals will be completed by 15 February 2016. 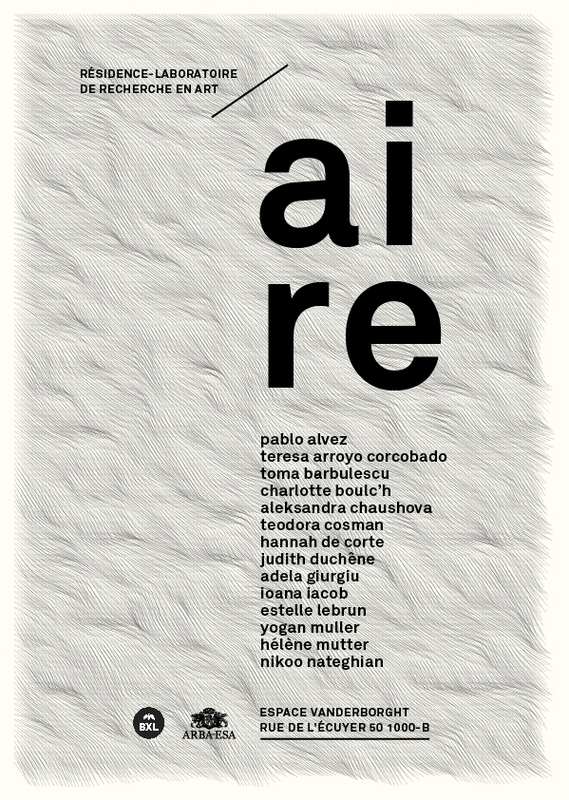 Partager la publication "Du 28/04/2016 au 29/04/2016 : International Conference on Artistic Research, The Hague"
A l’Institut supérieur de philosophie, pendant toute l’année académique 2015-2016, organisé par Oleg Lebedev. La fréquence des réunions et le calendrier seront fixés durant la première rencontre, le mercredi 14 octobre 2015. Aucune connaissance préalable n’étant nécessaire, tout le monde est le bienvenu. 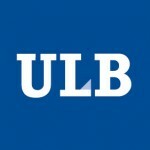 Les personnes intéressées sont priées de s’inscrire en envoyant un e-mail à oleg.lebedev@uclouvain.be (le nombre de participants est limité). Partager la publication "Groupe de lecture « Mille plateaux » de Deleuze et Guattari (2015-2016)"